While many of us want to live more sustainably, it can be difficult to make the switch suddenly. Most of us do better with gradual changes. It might take longer to become as green as you want to be, but you are more likely to see permanent changes. Many stores are perfectly willing to let you bring in your own reusable grocery bags. It saves them money, as well as saving the planet! When you bring in your own grocery bags, you use fewer resources. If you aren’t sure about buying reusable bags, at the very least, you can save the bags from your last shopping trip and bring them in. If you want to get really creative, check to see if you have any unused tote bags lying around the house. These make great shopping bags, and you won’t have to buy new bags. We installed a filter for our drinking water, and now my family longer needs bottled water. While the filter cost a little more up front, we have savings over time. The filter paid for itself after two years, and the maintenance costs on the filter are still less than what we were paying for bottled water before. So, instead of using resources for plastic water bottles, we all have our own BPA-free water bottles that we can refill. This simple switch can save you money and green your lifestyle a little more. Our society has programmed us to look for new first. However, it makes sense to look for used items before you go buy new. Used items don’t use up resources at the same rate, and many of them work just fine. Look for a consignment shop in town, visit Freecycle web site, or check the Classifieds before you go to the store to buy new. You might be surprised at what you can get. Gardening is an enjoyable activity, and it can help you improve your sustainability. You don’t need a huge garden, either. In fact, if you are new to gardening, it might be better to start small. Plant three or four things, just to get started. Even if you don’t have a lot of room, you can grow a container garden. The added plants will help with the air quality around your home, and you’ll save money by growing your own food. Considering replacing your standard light bulbs with CFLs or with LEDs. These light bulbs use less energy, and create a greener home. If you can’t afford to replace all the bulbs in your house at once, create a plan to make the switch a little bit at a time. It took us about a year to fully replace all the light bulbs in our house, and we replaced our Christmas tree lights with LED strings over the course of two years. Now, though, our power bill is smaller, and our home is a little greener. On a related note, try to be conscious of how much electricity you are using. Turn off lights when you leave a room, and make it a point to use natural lighting whenever you can. Smart plugs can help you reduce the “energy vampirism” of your electronics. Use low-flow toilets and shower heads that use less water. Once again, you can replace your old fixtures over time, using a schedule. While you’re at it, be mindful of how much water you run. Do you need the faucet full blast while you rinse dishes? Could you turn off the faucet while you brush your teeth? A little conscientiousness can go a long way. Keep your neighborhood cleaner by picking up trash. You can do a service project with your kids, or just clean up when you can. Keep a trash bag in your car so that you are prepared. It’s a small thing, but it’s a good habit, and it can make your little corner of the world much pleasanter. As you can see, going green is not that hard and just takes small changes. What kinds of things do you do be greener? These are all great tips! We have trying to do a little bit of all of them until we change our habits. Almost all of our lightbulbs have been changed over now! Thats great. We have a couple more to go but then we will have all of ours changed over too. Great tips! We do many of these ourselves. I could not agree more on the bottled water. We installed a water filter several years ago and use our Nalgene bottles. It tastes much better and has more than repaid itself. We have a water filter cooler. It works great. We just pour water into it and it filters it and keeps it cold. It also has a kettle which is really handy. Great tips. I am amazed how few people bring their own grocery bags. I hate it whenever I make an unexpected stop at the grocery store and forgot to put the bags in the car. I hate that too. I got smart and started leaving cloth bags in my car so that I would be prepared if I had to stop unexpectedly. Excellent tips! Giving up water bottles is huge … we used to buy bottles of water every time we went for a drive. We spent a LOT of money and all those plastic bottles ended up in a landfill. Now we fill our reusable bottles … we’re saving money and avoiding landfill trash. I am so glad you made that switch. I see so many people using the plastic water bottles around me. It is really upsetting knowing where they are going to end up. I am pretty good at 1, 2, and 3 – and hoping to do number 4 this year. 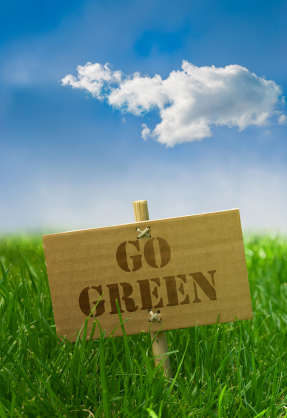 I’m going green by WAH a few days a week – saves me money and time as well! That’s great to hear. I find lists like this a great way to take actions to make change. You just do what the list says. Great tips! These are really helpful tips to help save our environment and they even help to save us money! Most things that save the planet cost less. We’ve been doing almost all of these although I could work on picking up litter when I see it and cut back in the summer on water bottles. Great reminders! We all have areas we can improve on. The key is we just need to keep working on them and not give up. That is awesome. We also have a garden and love it. The stuff tastes amazing. Plus we get a real satisfaction from growing our own food. The best thing is not paying organic prices for organic food. I love this post! When CFLs first came out my husband and I decided to replace our bulbs as they burned out. We would buy the large multipacks at Costco. We then found a nice supply of decorative and smaller CFLs at IKEA. I’m not a huge fan of LEDs because I don’t like the color of the light but they have their uses in our closets and garage where the color of the light doesn’t really matter. Does anyone remember back when it was an uphill battle to get people to recycle? I’m old enough to remember hearing people grumble about it being too much trouble. We don’t all have to be green geeks…but we do need to do what we can when we can. Very well said. We have replaced almost all of our bulbs. Just waiting for a few more to finish. I find people still grumble about recycling which I think is sad. It isn’t hard and it is really meaningful. We can all do our part to be green if you ask me. I’m doing pretty well on most of those things but the one I’m the most excited to implement this summer is a garden. I plan on planting a few vegetable plants in a small plot and go from there. These are all great tips. My first move into Going Green was getting a water filter. I don’t think I’ve bought more than one pack of water bottle since (and that was an emergency). So much money saved, and the water tastes just as good. Most water bottles are just filled with filtered pond water anyways. Great list! I love how all these things are easy to make into habits for people who are just beginning to think about going green. We practice a lot of these, and we also find other little ways to consume less – we rarely use our dryer (a good old fashioned clothes line works just fine) and we try and bike to places that are within a few miles from home (like the library, park, and grocery store) instead of driving. Planting a garden is on the list for next year! I can appreciate how much research you did on this topic and you really came through with valid points of interest. Great post. We have to do something to protect our environment now. You simple ways to go green is simple but effective. I will try them.